A walk in the rain, down along the river, drops plinkplunking on the water, the leaves, the trees, the flowers, everything wet and still drops plinkplunking. Walked over to Lookout Point and caught just a flash of little white tail and gangly legs leaping westward through scrubby shrubs and flowers—I startled the fawn. No other deer in sight, but earlier from the kitchen window I had seen three deer in the north field grazing, moving west to east. 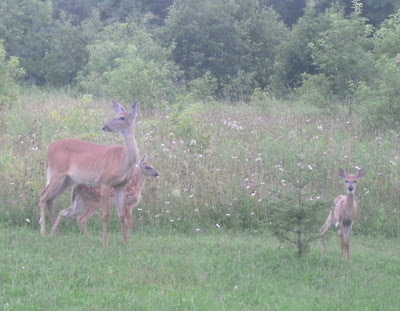 Conjecture: Sadie, the deer with the scar on her left shoulder, is the mother deer. 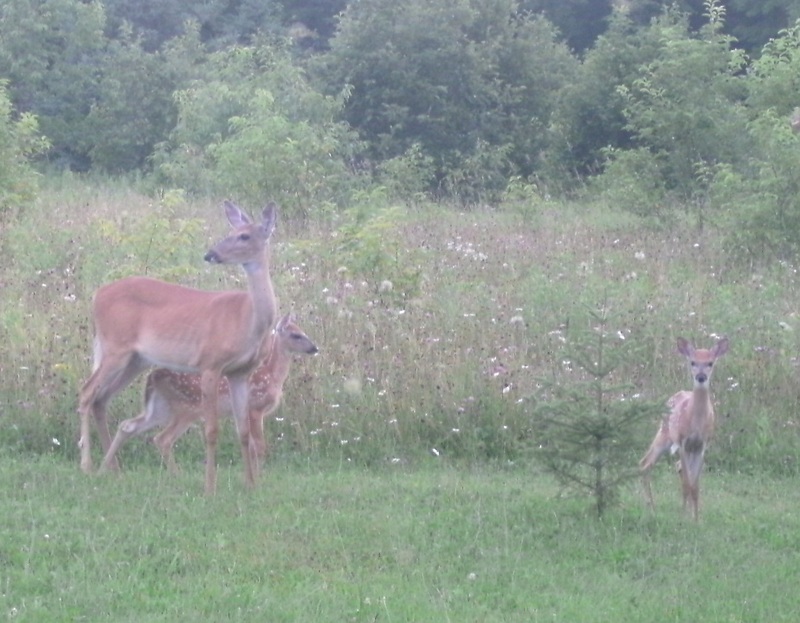 Deer #1 and deer #2 are her female yearlings, and then there’s the fawn. After a day of 45 degrees and rain, temps back up in the 70s with sunshine. The bugs laid low yesterday but came out in style today. Sitting out on the porch after dinner the strangest thing flew by—it looked like a slightly bent toothpick with black and white horizontal stripes. It flew by in an upright position, reminding me of Miss Gulch on her bike. Very strange. Sometimes I wonder whose world I am living in. And the hummingbirds are fighting over the feeder again, zooming through and around the porch so fast one almost smacked into me. 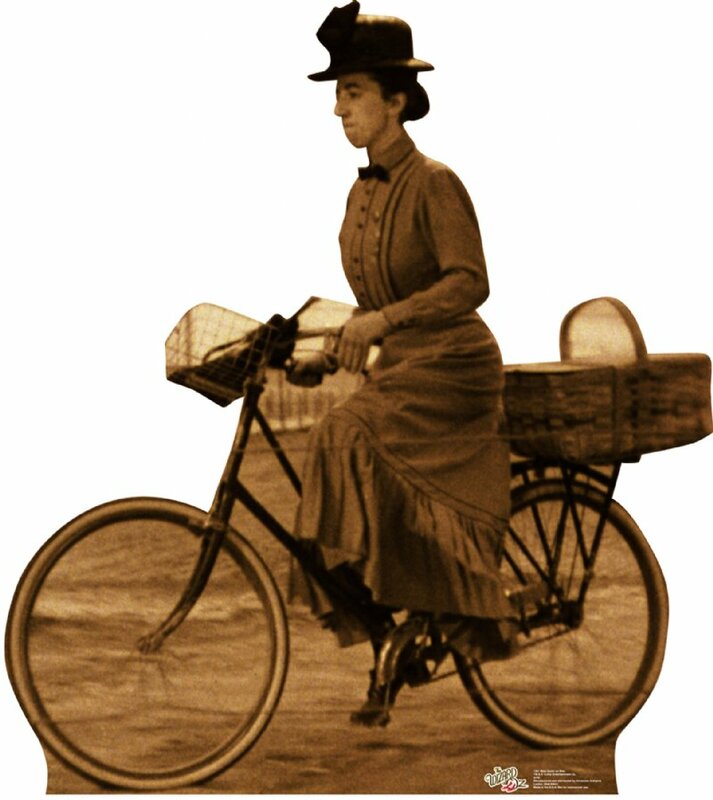 Click here for the source of this photo. Sadie was by early this morning, but have not seen Mortimer and Sneed (deer #1 and deer #2) or the fawn. News Flash! 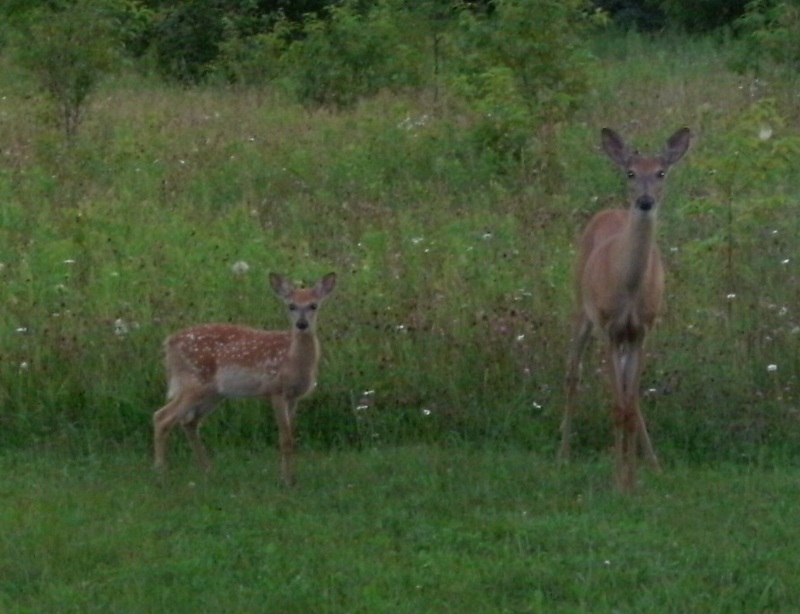 There are two fawns! After writing last night I walked into the kitchen and saw through the west window Sadie and her two fawns, Hansel and Gretel, on the edge of the lawn. All three were staring at the cabin, specifically, I believe, at Elliott, who had last been seen lounging on the mat in front of the door. I snapped some pictures, which seemed to spook Hansel, and the deer soon left, hiking down the trail to the river. I opened up the front door and Elliott fell into the house. Sadie and Hansel, who appears well fed. Hansel gets a bit skittish. No deer sightings today, but there was a rather plump frog down toward the end of the river trail, by the graveyard, so well out of the water. It was a plain mottled brown frog, about the size of my fist. Sadie and her fawns were in the yard this morning, but the fawns must have seen me through the window—they took flight, and Sadie followed. Elliott was inside. Was feeling a bit peevish this afternoon, so took a walk and saw this butterfly. 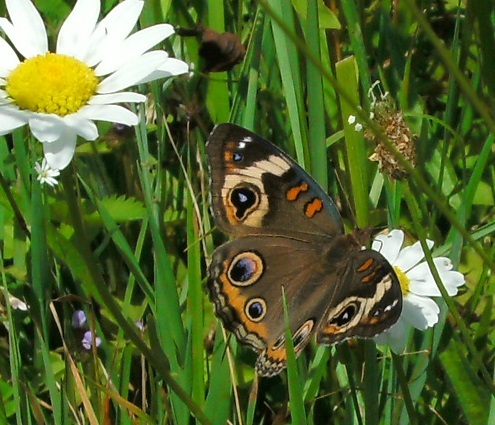 I believe it is a common buckeye. I thought it looked rather extraordinary. The website through which I identified it had a map showing the buckeye’s range as going no farther north than southern Wisconsin, so I submitted an ID request through another website, Butterflies and Moths of North America. We’ll see what they say. Not much reason for the peevishness, but it was lingering, so a bit ago I motored up to the corner for ice cream—a quart of Jilbert’s Mackinac Island Fudge. There is nothing quite like settin’ on the porch on a late summer afternoon with a big bowl of ice cream. When I was done, Elliott cleaned up. The peevishness may be bug-related. Still a lot of mosquitoes and little black flies and things. I suppose it is all the rain. Also, I just get too darn hot. Earlier it was 65 degrees, clouds and sunshine alternating, a nice breeze from the northwest, and yet, mowing the lawn, I was hot and sweaty and damn uncomfortable. I wonder if it is age, or just me. It seems unreasonable to be hot when it is only 65 degrees out. Of course I am also sick and tired of mowing the lawn. Yes, that was good. And the peevishness is also this: I am tired of summer. It is too labor-intensive. And Monday I report for jury duty, which I could see as a nice break, but which I am already loathing. So. You see what I mean. And it doesn’t help that I am pining away for the man I love. Why must I do that? Perhaps more ice cream, to bring me to the moment. Today, not so hot. Same temp, but maybe the breeze from the northwest is a bit stronger. When I headed out for a walk I tucked my head net in my back pocket, just in case, which I did not do yesterday, and when I veered over to the wild raspberry patch I was able to enjoy quite a few. This patch is on the north edge of the gully, where the mosquitoes have set up summer camp—summer breeding camp, that is. A few raspberries right off the bramble are good eatin’, but what I love are the serviceberries, up here called “sugar plums.” They have been ripe and tasty for more than a week now, and there are several small trees throughout the fields. A bit in the local paper mentioned that chewing the seeds is reminiscent of almonds, so I tried that. Yes, indeed! I also discovered a patch of wild bergamot and the honeysuckle bushes are loaded with bright red berries. I did startle a deer down along the river, but could not tell who it was. According to the paper, the trial—a case of embezzlement—has been delayed until late October. I would be so happy not to get involved. For one, the trial is scheduled to last five days. I sat on a jury in Chicago once and found it interesting, plus it was a diversion from my office job, for which I still got paid, but this time sitting on a jury would take me away from work I have to do regardless. The trial was postponed at the request of the defendant; a few weeks ago it was postponed because the Village of L’Anse was shutting down water service for some construction project the same day the trial was to start, and no one, I guess, wanted to go to trial without running water in the building. How lucky can I get? So, peevishness past and loads of ice cream yet in the freezer. Friday night Sadie pretty much had Elliott trapped somewhere down the drive, maybe no farther than the gravelly neck, where the drive passes over the creek, but maybe farther, as she disappeared down that-away, stamping her hooves. Hansel (or maybe it was Gretel) was over by the apple trees. I was inside. 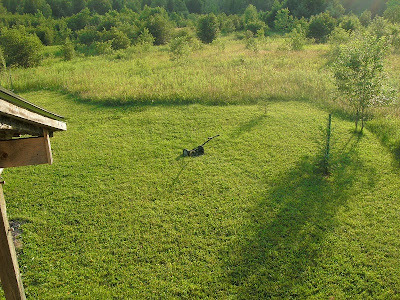 When I lost sight of both deer I went out on the porch to call Elliott. He streaked across the yard, came right inside. Last night, another turtle crossing the road. Lucky for you, because just before I saw the turtle “You Should Be Dancing” by the BeeGees came on the radio. It had been playing just as I pulled into the farmers market that morning, and now it was playing just as I was returning home. Odd enough to end this week’s post with. But, saved by the turtle!